Going through my top dresser drawer makes me feel a bit like Forrest Gump opening a box of chocolates. I never know what I am going to get. Over the years what should have been a drawer for socks, handkerchiefs or some other article of clothing has become something entirely different. 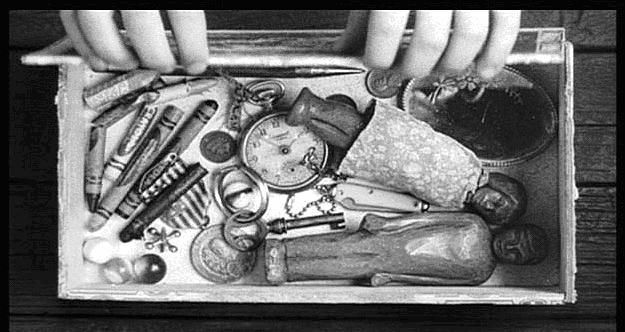 Instead of a dresser drawer, it is more of a cross between the kitchen junk drawer and the trinket box from To Kill A Mockingbird. I have put off tackling this area because of the variety of items it contains. There is no one category to define its contents. Over the years I have to come up with different ways to keep it somewhat organized. I hate junk drawers and especially despise just throwing everything into a heap. So over time, when I emptied a box of checks I took the boxes and used them as separators. Yes, I know it sounds tacky and yes, it is as bad-looking as it sounds. But, in my defense, it was somewhat organized. I waded in, slowly, not wanting to drown in the sea of debris that was a distorted but not entirely inaccurate reflection of who I am. Key rings of various sizes along with non-functioning mini flashlights and a laser pointer with weak batteries filled one box. “Maybe I can fix this flashlight?” In another box I found a mini screwdriver and loosed the tiny screws that prevented easy access to the flashlight’s battery compartment. Now apart, I tried removing the battery but realized I had tossed potential replacements into the trash just a moment earlier. Into the trash I ventured hoping that somehow I would miraculously grab one of the stronger batteries and not a dead one. There was no methodology applied in doing this. I grabbed the closest one. Thinking I was one step closer to salvaging the light, I was unable to remove the old battery and the guts of the device began to fall apart. In you really want to get rid of something and don’t have the heart to toss a gadget that appears to be potentially usable I will share my secret to overcoming this. Take it apart and try to fix it. If you are like me you will fail at this. And so the mini flashlight, the battery I was going to use to revive it and another mini light on the same key chain all went into the garbage. Even the mini screwdriver broke into two pieces and so that was tossed as well. Even though this was a small advance it was still a step in the right direction. Next I encountered 2 to 3 shoelaces. Why? Because I would forget that I had one and then buy another. Why? Just in case. Okay, there is nothing wrong with having a spare set of laces. But these have been in the drawer for months and maybe years so they too will go, along with several sun-glass neck cords. What’s this? A very small pouch of something that looks like translucent rubber bands. I have encountered this item before. I did not know what it was the previous times and still do not recognize what it could be used for. I open the pouch this time because now I am in the proper frame of mind. After turning the item around several times I decide that it might be something to hold bed sheets in place. Or not. In the past I recall putting this item back, afraid that I would throw it out and then realize later that it was needed. Not this time. Into the trash it went. A sense of accomplishment brought a smug grin to my face. I was mastering the drawer. It is only a matter of time now. I’ve got a couple of days off this week. If I can empty this one drawer to the point that whatever remains is of impending usability I will have hope that the next drawer will be handled with increased momentum. Pray for me. Little things count. Bags of clothes sent to Goodwill, community centers and drop boxes count. Seldom used household items and non-sentimental trinkets are all candidates for the downsizing process. Garage and yard sales lose their attraction. Instead of looking at them with the thought of what treasure you might find, you long for the day when you can have your own sale. Everything I see now causes me to question its long term utility. It is a change in my thinking that I wasn’t expecting. One must be a bit careful. It can become easy to look at everything as expendable. I’m not quite ready for that. Getting rid of something only to find I would need it will cost me in the end. That is one benefit of starting a purge while there is no hurry. A time will come when I am ready to move into a smaller space and the need to get rid of stuff will be more urgent. By that time, I expect to have much less than I do now so that the process is not overwhelming. The last things you should get rid of are clothes, tools and cooking items. At least that is what I am thinking right now. I am not following a particular plan but taking bits and pieces of what others are doing. Some of the people I’ve read are over the top and into lifestyles that are not of interest to me. I am not a vegan, yoga practitioner or tree hugger. I am not interested in eating bugs, hunting my own food or growing a garden. The nomadic lifestyle is somewhat alluring, offering the opportunity to see different places and not be tied down to one location and climate. Having lost my wife has made it easier to get rid of material things. When you no longer have the person who means the most to you, everything else’s value decreases. Of course I am not talking about people. Inanimate objects no longer hold the appeal they once did. And so we can more easily part with them. Stay tuned for more on my path to smallness. In my post “Get rid of all the things” I started to talk about my decision to get small. After selling a few things I am looking at what is not sellable (I think I just created that word). In a cabinet full of old papers I found many more tax returns than is required. It took about 2 days to shred documents going as far back as the eighties. The temperature light on my shredder forced me to give it a rest so the motor wouldn’t burn out. Now I am sorry that I missed a recent event where shredding was free. Oh well. It becomes boring to keep looking for papers to shred so I switch my attention to my closet to consider what I don’t, can’t or shouldn’t wear anymore. The ugly sport coat I bought on eBay and a couple of uncomfortable running suits that I’ve never warn (I do not run or even walk very fast) because they were on sale have been dropped off at places where others can buy them. Simplifying and minimizing is more than getting rid of stuff you already have. It means you do not not buy as much either. When something wears out it is a sign that you use it enough where you might need another one to replace it. Unless I join a nudist colony, socks and underwear will always have to be replaced. I have too many ties and only one suit that I’ll have to lose a few pounds to wear comfortably and just two sport coats. This means some of these ties can go. I’m thinking that winter is a bad time to review my warm weather wear and summer is the wrong time to start getting rid of sweaters. Better wait to see what I need in these seasons before I start purging. I do not want to spend every off hour searching for items to get rid of. There is no hurry. It is nice to be able to take my time about it. By the time my life is ready for another change hopefully I will have rid myself of enough to where there will not be too much to work on. I don’t expect to ever reach the point where I’ll have so little I can fit everything into one trunk like John Candy in Planes, Trains and Automobiles, but I feel like I am making progress. I finally did it. After spending a great many years working in positions where I couldn’t wait to go home and dreaded waking up in the morning, I made a huge change in the type of work that I want to do. I’m not sure if this something we can all do. “They” say to do what you love and success will follow. That is a much easier plan for those who start life with some idea of what they want to be when they grow up. Back in the day, as my son would say, I had a notion of what interested me. Although I got off to a decent start, I failed to follow through. I have no one else to blame but myself. Sure, I could rattle off a list of circumstances that legitimately caused some changes in my life. Ultimately, we are all responsible for the choices we make, or that we fail to make. I have not had a bad life. I married a wonderful woman and I wish more than anything that she was still here with me now. We raised four fantastic children who are smarter and more talented that I ever was. I had a career and jobs that, regardless of my complaints, kept a roof over our heads and food on the table. Now I am in another season of life where my lifestyle and choices affect only me. And so, I gave up my search for the highest paying jobs that were geared toward my accumulated experience and turned in a completely different direction. In the past year I left a position that paid better that I could have hoped for at my age and with my limited skills. I gave up the security of earning enough to pay my bills. But, most of all I gave up work that I did not enjoy. And that, my friends, in the point of this story. With a few dollars saved and much trepidation I began a search for “fun” jobs. This was not an easy way to look for work. Career builder, Monster and the other job search engines apparently consider quite a variety of jobs “fun”. I beg to differ with their opinions. So it was up to me to figure out what a fun job really is. I knew I wanted to work with happy people. In a nutshell, I needed to avoid unhappiness. All my previous jobs seemed to be in the arena of serving disgruntled consumers who were victims of unfortunate circumstances. After many years of working in this type of environment I began to assume that everyone is basically unhappy and angry. This is not what I wanted. I tried to imagine places where everyone was happy. Disney World? Too far away. Fitness centers? One look at me and any potential member would find another facility. Entertainment? I can’t sing, act or dance. I started to consider tourist attractions and other fun places such as vacation resorts. I even considered the travel industry. After all, who is happier that someone going on vacation? After many fruitless searches I found a position as photographer with a vendor associated with none other than one of the most famous and long standing entertainment venues, tourist attractions and historic places in the world. And so I became a photographer at the Grand Ole Opry House right here in Nashville. Everyone who goes there is excited. No one is upset. No one is angry. No one is disgruntled. If ever there was a group of customers, actually they are guests, who are happy about where they are, it is these folks. In the short amount of time that I have been in this position I have interacted with tourists and vacationers from just about every state in America. I have also met people from many other countries. Young people, old, and every age in between. I have learned much about photography and am learning more all the time from my teammates. Everyone I work with has been kind, welcoming and helpful. Everyday that I am scheduled to work, I drive to the Grand Ole Opry House. I walk into a place where countless country music artists have walked. I stand on the stage where they perform. I take photos of people standing on a world famous, priceless, 6 foot circle of oak that was cut out of the Ryman Auditorium many years ago. I have walked on that same spot countless times since working there. I look out from the stage at the same seats and lights that the artists see. Best of all, my job is to tell people to smile and let me capture a moment that they will never forget. Some guests have become overwhelmed and actually cry as they stand on the circle while I take there picture. Some bend down and rub their hands over the wood. Others just stare at it in wonder. I have seem pnople lay down photos of friends and relatives who passed away before they could make the pilgrimage here. The guests are babies, parents, high school groups, senior citizens. People have come onto the circle with walkers and wheelchairs. The wood creaks when walked on telling, how old and seasoned it is. Everyone is respectful and aware of its significance. And so right now I am at the right place and at the right time in my life. I have other plans for my future but this is a big part of it. I am not going to get wealthy doing this but happiness has its own value. I’ve learned that doing something you enjoy sometimes means you have to scale down and make your lifestyle fit your paycheck instead of trying to make as much money as possible so you can have lots of stuff. At least that is the case now for me. I am past that time in my life where I need a large house and fancy car. Now I just want to enjoy each day. An open letter to my wife on what would have been our 33rd anniversary. Today would have been 33 years of marriage. It’s hard to know when to stop counting. The words “Happy Anniversary” have lost their meaning. Soon you’ll have been gone for 4 years. Of course the 1st one was the most difficult. They have become easier as time passes. But, easier is not the same as easy. It will never be easy. Getting accustomed to life without you has been an ongoing project that will never be finished. Reading about others in the same boat and encountering those who have recently lost a spouse reminds me that this is part of life. Not a good part but a part never the less. After a while I have begun to develop and fall into new patterns. Or perhaps I am just falling back into some of my patterns from when we were not yet married. It is difficult to remember that far back. That was another life. And now, this too is another life. When a couple marry, we become someone different than the person we were previously. So much changes. And now, being alone again, I am once again becoming someone else. At least that is how it feels. Whoever I become, it is just another part of life. The circumstances that brought us to this point were beyond our control. Now many things are in my control, though not all that I wish. Whatever comes now, be sure that you were, and are a part of who I am. I hope that side of me that you helped make is always a part of me.